Double Pink Knockout Roses and a Thank You! They've started blooming like crazy! and it makes me so happy to see them every morning out my windows. These roses are on one side of the fence and on the other I planted salvia, coreopsis, nepeta (Walker's Low) catmint and white oriental lily bulbs. I can't wait for it to all mature and fill in. Also, I just want to say that I was seriously BLOWN AWAY by all of the comments and features of my girls' room. 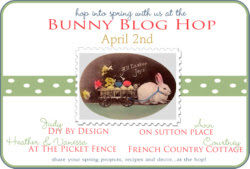 I hope you will go over and see all of the beautiful spring projects!